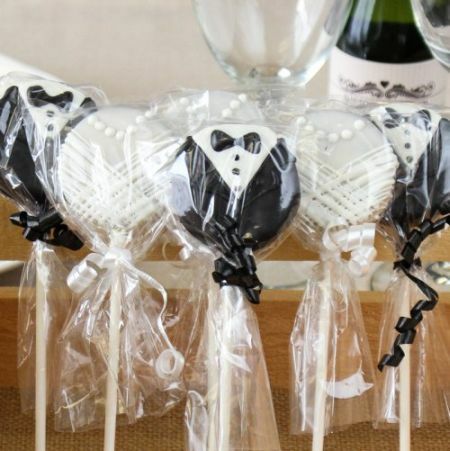 You might not think of Oreo cookie favors when choosing a wedding favor, but now you can. 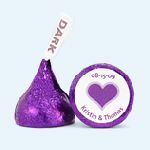 They can be dipped in dark milk or white chocolate and have sprinkles on the edges creating a picture frame for an edible wedding image. You may choose a classic wedding scene such as a bride and groom, a dove, or a single heart. 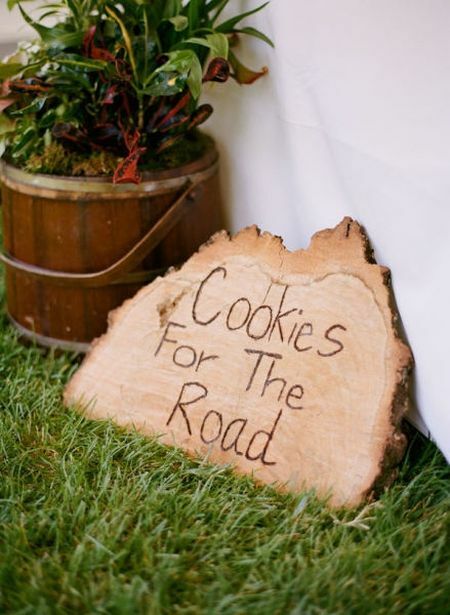 This best selling cookie of all time would be a fun wedding favor to share with your friends and family. 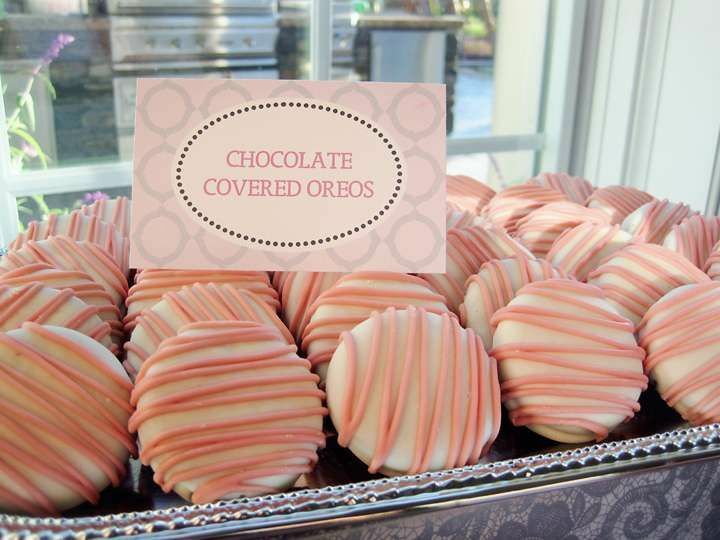 Oreo cookie favors can also be personalized with a favorite picture or text. Any full color image can be transformed into an edible one. Completing with personal touches such as names or the wedding date are another big opportunity for creativity to shine. 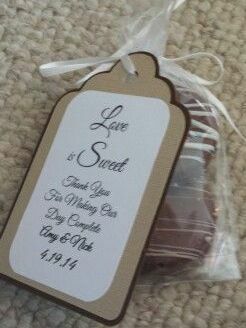 Creating a memorable presentation of your wedding favors guarantees that the thank you message is conveyed in a special way. Complimenting the ambiance of the wedding is key here, and as always it is the tiny details that make the difference. Make every crumb of your favor presentation beautiful with one of these simple ideas that says thank you ever so sweetly. A beautiful gold container filled with monogrammed Oreos makes an impressive cookie bouquet. What could be easier than this? 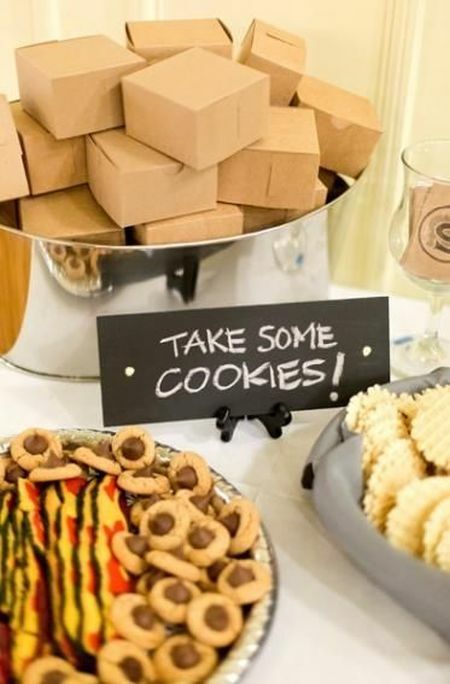 Secure cookies into Styrofoam, top with shredded filler, and tie on a pretty ribbon. The ingredients? 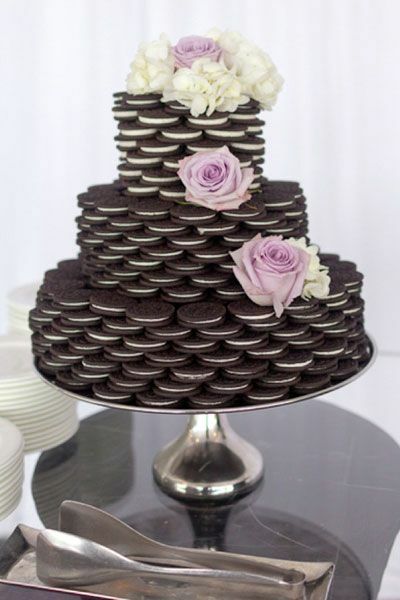 A decorative cake plate piled high with cookies and frills. 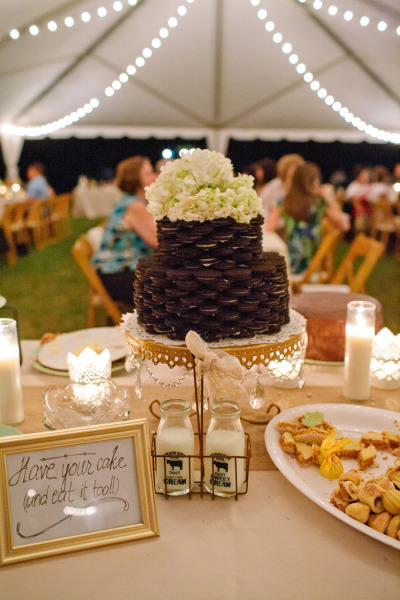 This table is a perfect example of how sophisticated Oreo cookie favors can look. This cookie presentation strikes the perfect balance between pretty and rustic. 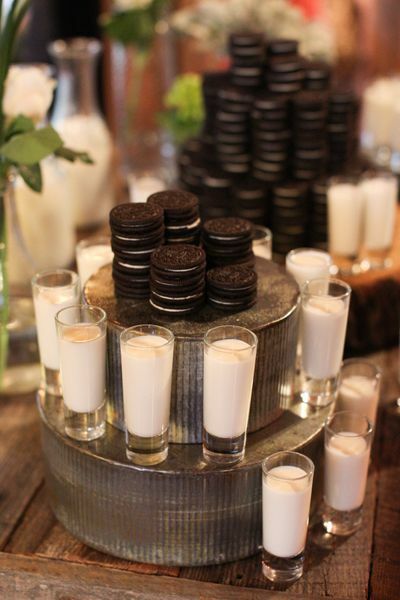 Stacks of Oreos and shot glasses filled with milk give a nostalgic nod to comfort food - perfect for a vintage wedding. Easy on the eye elegance. If your decorative scheme is pale and plain, it is a good idea to add subtle patterns wherever you can. 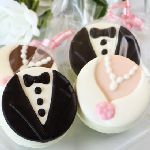 Adding decorative details to these chocolate covered Oreo cookie favors brings visual texture and understated elegance. Just because your having milk and cookies doesn't mean you can't make an occasion of it. How you present cookie treats is up to you, but the more creative you are, the more impact the favor presentation will have. Wood you like some cookies? 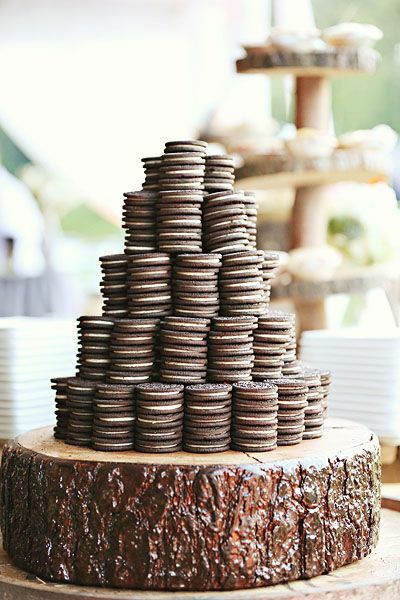 Nothing will do more to liven up your Oreo cookie favors than a noticeable presentation. The key is to make your presentation as inviting and adaptable as the occasion itself, with plenty of serve yourself elements. 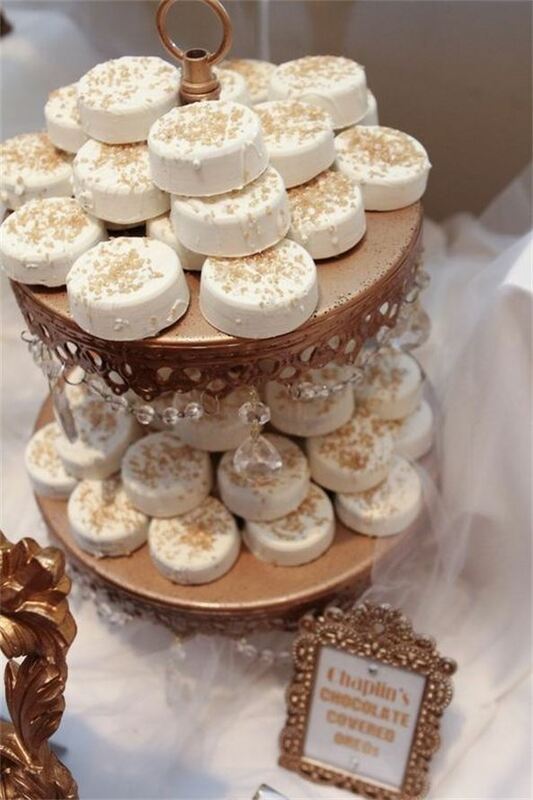 When the occasion provides the perfect excuse for indulgence, think whites, creams and ornate glamorous gold. The sparkling glass accents to the vintage serving piece take the luxurious effect one step further. Getting the foundation right makes all the difference. The trick is to start in the middle and build out until you have built yourself a good base. Each time you add a layer, start in the center and check the cake for stability. Once all the layers are looking cake like, adorn until it's pretty as a picture. 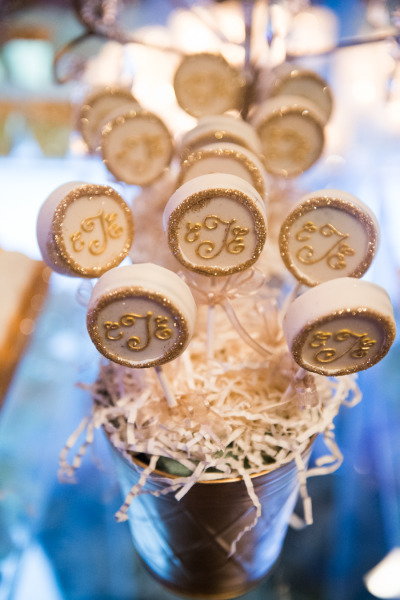 Wedding guests love edible favors, and you can never go wrong celebrating the happy couple. 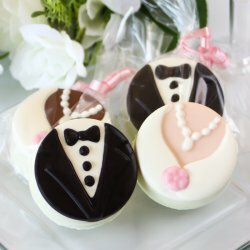 Oreos dressed up to resemble the bride and groom is the simplest and quickest way to get the message across, and fit in with almost any decor. 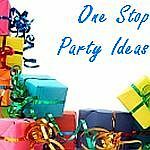 Successful favor ideas are all about making the most of the theme. 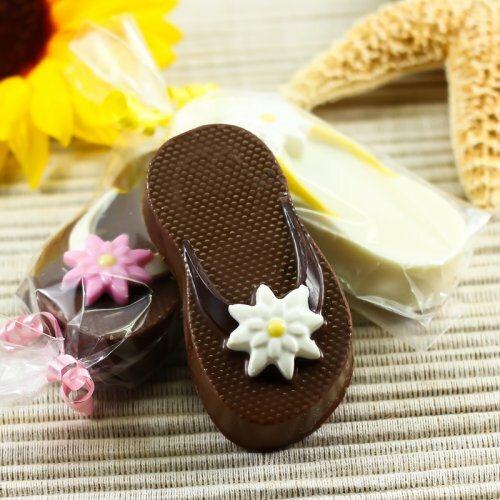 Delicious Oreo flips flops are a popular choice for beach themed wedding favors. 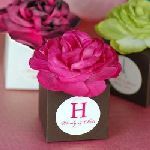 You can customize the chocolate and flowers to match your own personal taste. 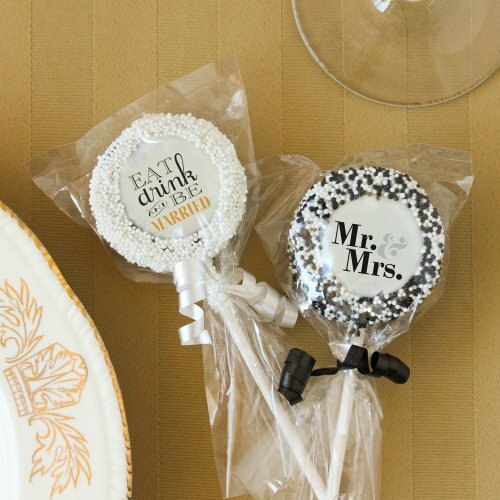 Prettily packaged Oreo pops bring a welcoming decorative element to the table. Choose a special design and sprinkles in your choice of color to make a perfect cookie favor. 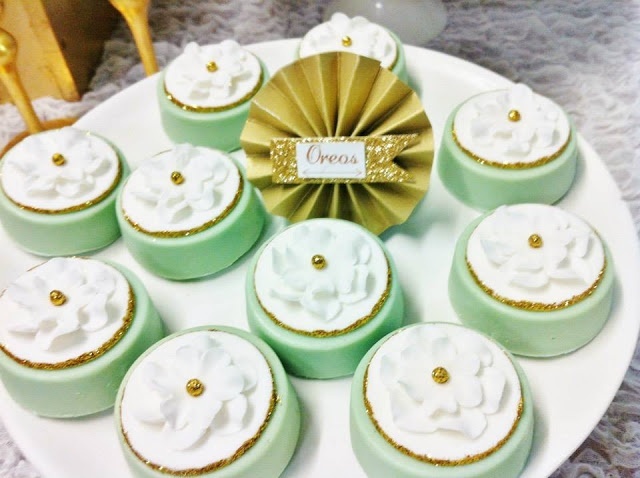 These beautifully hand decorated mini Oreo cookie cakes are the ultimate in edible favors. 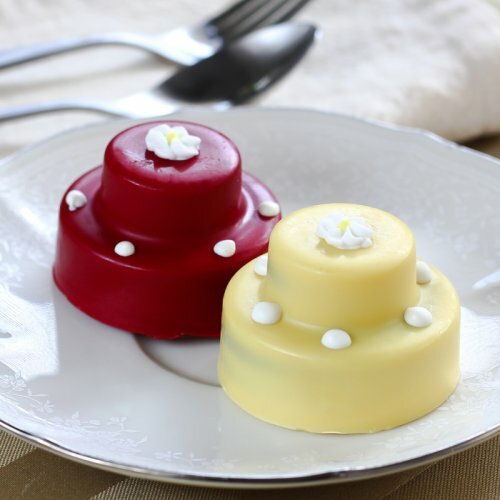 They are a delicious way to say thank you and a smart alternative to the tradition of sending guests home with a slice of wedding cake. 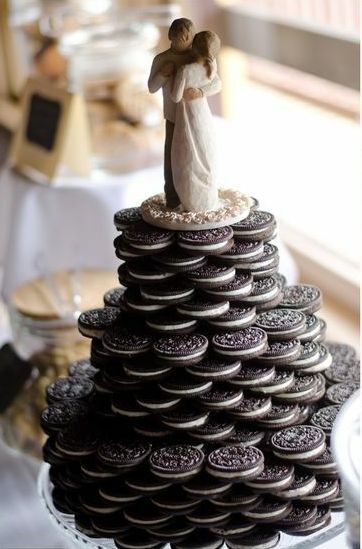 Include Oreo cookies in your wedding candy buffet. No matter how you eat them, whether you dip them in milk or twist apart and eat the middle first, Oreos are sure to be a sweet thank you. Create a variety of personalized Oreo cookies and give them as individual favors. Wrap cookies in small cellophane bags with a color coordinated ribbon and tag.